Request the brand new 2019 Pathway to Victory Devotional! This beautiful, leather-bound devotional is filled with 262 devotionals for reading and prayer time Monday-Friday, 52 weeks of the year. The two-tone green leather cover features inlaid medium oak brown and gold foil. 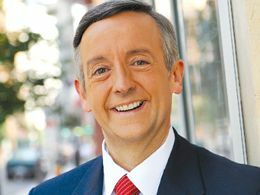 The 2019 Pathway to Victory Daily Devotional — your personal, faith-building, and practical Bible teaching from Dr. Jeffress to help you grow your faith in the year ahead!